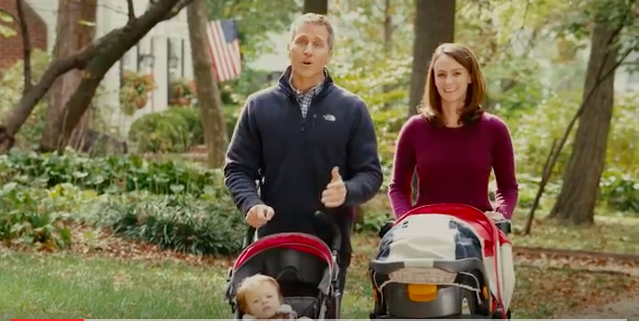 Sheena Greitens, shown with her husband in a campaign ad. The wife of Governor Elect Eric Greitens was robbed at gunpoint in Midtown St. Louis tonight, not far from the couple's home in the Central West End. Sheena Greitens is "safe — but shaken," Greitens wrote in a Facebook post around 9:30 p.m. "We are grateful for the men and women of law enforcement. Their response was swift and skilled, and we thank God for their presence tonight." St Louis Police tell the RFT the incident happened around 6:18 p.m. in the 3900 block of Pine — and that they already have three young male suspects in custody. According to the police incident report, Sheena Greitens was in her car looking at her cell phone after leaving a restaurant when one suspect opened her car door. "The suspect pointed a gun at the victim and demanded her property. The victim complied and gave the suspect her laptop and cellphone. The victim then observed several black males running from the scene," the police say. According to the police statement, "Further investigation revealed another vehicle on the parking lot had broken into. The male victim stated his cellphone had been taken from the vehicle. The victim began to track his cellphone which led officers to the 4200 block of Shreve. As the officers got behind the vehicle and attempted to stop it the vehicle fled and was involved in an accident. Three black males fled on foot from the scene, however, they were located and taken into custody." The suspects are black males ages fourteen, fifteen and nineteen, according to the police. They say the vehicle the youths were in had been stolen earlier from the 3700 block of Lindell, and had also just been used in an attempted robbery in the 3100 block of Locust. "Property from the robberies and vehicle break-ins was recovered in the suspect vehicle," the police write. "No injuries were reported. The investigation is ongoing." Tonight, my wife Sheena—the mother of my two boys, and the future First Lady of Missouri—was robbed at gunpoint not far from our home. She is safe—but shaken. We are grateful for the men and women of law enforcement. Their response was swift and skilled, and we thank God for their presence tonight. I have spoken in the past about the importance of public safety. About the need to take care of the men and women of law enforcement who have our backs. About the danger too many Missourians feel walking in their neighborhoods at night, or taking their kids to school, or going to the grocery store. If tonight's incident has done anything, it has only served to strengthen my—and our family's—resolve. We are, now more than ever, committed to the law enforcement officials who were by Sheena's side within minutes. We are, now more than ever, disturbed by the violence and chaos in our communities. And we are, now more than ever, focused on the mission of creating safer neighborhoods for all of our families and all of our children. We are also thankful tonight: for God's grace, for our brave men and women in law enforcement, for the safety of our family, and for the prayers of so many of you. 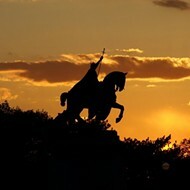 God bless all Missourians, and those who keep us safe. Sheena Greitens is an assistant professor of political science at the University of Missouri-Columbia. She earned her B.A. from Stanford and doctorate from Harvard; her work specializes in East Asia. Editor's note: We updated this story about 15 minutes after publication to include new details from the police. Among them were details about the robbery's location. While Eric Greitens indicated in his statement that the robbery happened "near" the couple's home, which is in the Central West End, the police report indicates the location was just a few blocks east of that neighborhood, in Midtown. Accordingly, we've changed the headline. We regret any confusion that's resulted.